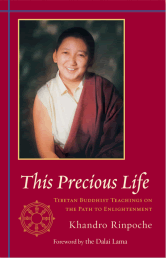 Using the traditional Tibetan Buddhist framework of the Four Reminders —the preciousness of human birth, the truth of impermanence, the reality of suffering, and the inescapability of karma—Khandro Rinpoche explains why and how we could all better use this short life to pursue a spiritual path and make the world a better place. The book includes contemplative exercises that encourage us to appreciate the tremendous potential of the human body and mind. This title is also available from major booksellers as an eBook.